We've had some short ribs in the freezer for awhile that I had mental tags for Korean short ribs. I know they are often gilled, but I wanted to do them in a chock pot. Why? Because cooking in the crock pot is so easy. I'm sure these are not traditional in anyway, but I looked at lots of different recipes for the sauce and they are seemed to have very similar ingredients. It's a pretty simple mixture yet full of flavor. Cooking the ribs in a crock pot braises them until they are fall off the bone tender. Perfect with just a little jasmine rice. Once thing I will say is short ribs are quite fatty and a lot of that fat cooks into the sauce. We didn't use any of the sauce left in the pot, so it didn't really matter to us. Though I think that sauce would be really tasty if it was let to set for a bit, the grease skimmed off the top and then reheated. Mix everything but the short ribs in a small crock pot*. Add the ribs, they should be covered about half way by the liquid. Cover and turn the crock pot to high. Let cook for about 3 hours, turning the ribs once. When the ribs are starting to fall off the bone, turn the crock pot to low and let cook another 2 1/2 - 3 hours. We have a small crock pot that we got at Target for like $7. It is the perfect size to fit these three ribs and have the sauce come up about halfway. If you only have a large crock pot and are doing a small amount of ribs you may need to make more sauce. You could also do this in an oven-proof pan in the oven at a low temp. 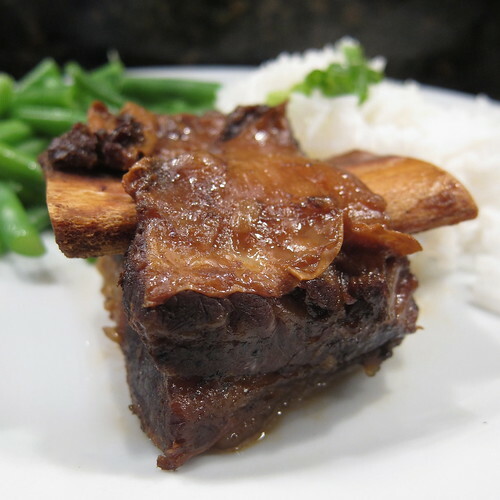 the ONLY way to have short ribs is asian style--hands down. I've never gone back. Great idea! We've got some in the freezer too. I need to try this. Oh. My. Goodness. I might have to make these this weekend! great flavors in this, kat, and it definitely looks fall-off-the-bone tender! I don't think I've ever made Korean-style short ribs before. Looks so delicious. Everytime I see a crockpot recipe I am so mad for lending my crockpot to someone and they never returned it and I can't remember who the person was. Fall-apart delicious!